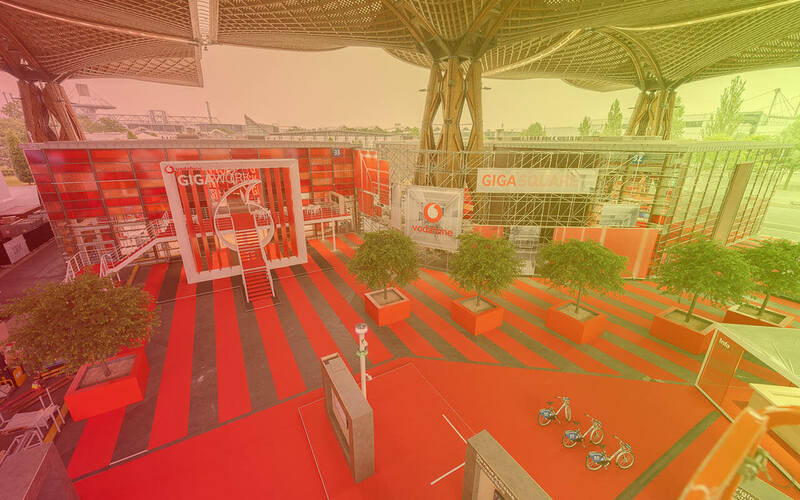 The Vodafone theme at the CEBIT 2018 fair was GIGASquare – and the company’s entire trade fair presence was just as gigantic. As the exhibitor with the largest stand, measuring 6,500 m2, the telecommunications company also offered outstanding design: a nine-metre-high gate covered in plants, a walk-in red LED cube and the very noticeable 5G Hyper Reality Experience Cube with a partially reflective facade. In the last week of the 29 assembly days alone, there were some 180 helpers assisting with construction and implementation. The main attraction was, of course, the showcases, about which there was a lot of buzz in advance – a total of 83 showcases were spread around the GIGALife pavilion which was primarily for end customers, the GIGAWork pavilion for business customers and the outdoor area. The undisputed highlight for the visitors was the ten-metre-tall 5G Hyper Reality Experience Cube that gave CEBIT visitors an extra-special virtual reality tour – including a virtual moon landing. This was a very special adventure which was particularly worthy of a GIGACompany. © 2019 Service Factory GmbH Inc. All Rights Reserved.